Hermann Reutter (1900–1985) is all but forgotten today, but he was an important figure in German music before, during, and after World War II. He was born in Stuttgart, and spent much of his career as Rector of the city’s State University for Music and the Performing Arts. As well as a teacher and composer, he was active as a Lieder accompanist, and songs in the tradition of Schumann and Brahms make up a large part of his output. The singers he accompanied included Hermann Prey and Dietrich Fischer-Dieskau, and their recordings of his works make up the majority of his available catalog today. But he was prolific in a variety of genres, especially orchestral music and opera, and on the strength of this disc of songs and chamber music, there are many fine works out there awaiting rediscovery. One possible reason for Reutter’s recent neglect was his relationship with the Nazis. He was a member of the party from 1933, but that didn’t stop some of his music from being denounced as “degenerate,” in particular his choral work Der neue Hiob, op. 37, which featured in the Düsseldorf Entartete Musik exhibition and was described by Goebbels as “horrible and unbearable.” But none of this seems to have affected his career, which spanned the 20th century, as demonstrated here with works ranging from 1926 (the Violin Sonata) to 1979 (Epitaph for Ophelia). By post-war standards, Reutter’s music is conservative, but he has a distinctive voice, combining Romantic and Modernist influences. The two song cycles here, both from the war years, are in a German Romantic vein, the textures more open than Pfitzner or Reger, but otherwise of that school. The two violin works are more progressive, with the early Violin Sonata in particular showing influence from Bartók and Stravinsky. The bare, open octaves that open the work almost sound like Ligeti, although the music soon settles into a more melodic style, albeit always angular and cleanly delineated. The Dance Suite was written in 1928 to a commission from Schott (the publisher was loyal to the composer throughout his life, and remains so today). They are pedagogical piano works, but with a twist, designed to introduce young players to modern styles. So the dance movements include a “Valse Boston” and a “Shimmy.” Unfortunately, the music here is surprisingly derivative, those two movements closely resembling Debussy’s “Voiles” and “Golliwog’s Cakewalk” respectively, and the preceding “Spanischer Tanz” almost a pastiche on Chopin. But elsewhere the music is more distinctive. The Epitaph for Ophelia is a freely ranging discourse on grief and despair. It is written for violin and piano (arranged from a chamber orchestra accompaniment), but for much of the work the violin plays alone, and the results are intimate and elegiac. In the song cycles, too, Reutter is clearly in his element. 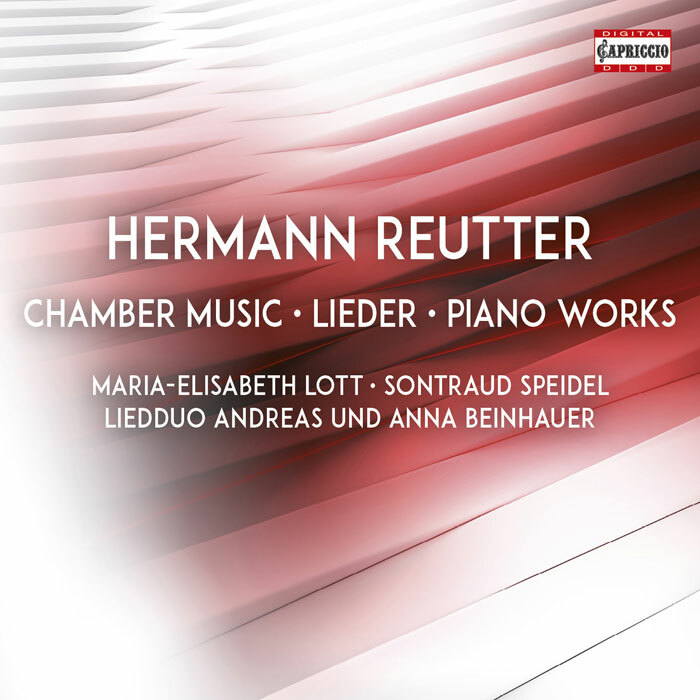 His experience as an accompanist shows in the restrained but effective colors and textures of the piano parts, and the vocal lines are all carefully but naturally calibrated to the cadence of the words, by Rückert and Hölderlin. Texts and translations are included, but even listeners with only a basic grasp of German are likely to pick up much of the text, such is the clarity of the settings and the elegance of the presentation. Baritone Andreas Beinhauer is ideal for this music, clear, rich, and emotive; a worthy successor to Fischer-Dieskau who previously popularized this music. Violinist Maria-Elisabeth Lott also excels, her sound tactile and immediate in the sonata, but floating and ethereal in the Epitaph. 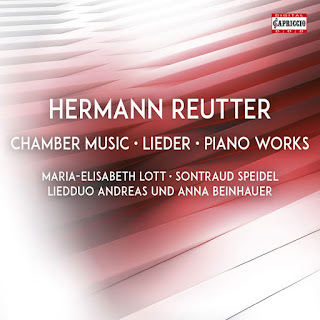 Good pianists too, although Reutter’s reticence in his piano writing means that both have to make much out of often spare textures. The warm soundscape helps, in well-engineered studio recordings. Another engaging and adventurous release, then, from the Capriccio label, and a tantalizing glimpse of a huge catalog as yet to be explored. This review appears in Fanfare magazine, issue 41:6.